So a lot has happened in the last two weeks since I last posted. The biggest news from this week is that I hurt my foot and then I withdrew from Rock ‘n’ Roll Philadelphia. Last week was pretty good. 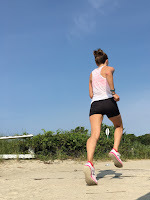 In fact I was happy I got to run with the Cape Cod Rehab group AND made it to run club! It was a rare Tuesday night that literally everyone on my run club friends’ group text was there. Even the unicorns! I even ran long on Saturday (10 miles) making it my first double digit run since my hip injury! The next week I took Monday off and had a hard time getting out the door on Tuesday. Wednesday my foot hurt and Thursday I struggled to make it a mile with Georgie. It’s been no secret that I’ve struggled coming back from my hip injury. Running felt like a chore. My head wasn’t in it—and neither was my heart. I thought Philly might be the motivation I needed but it ended up adding more stress. Timing just isn’t right and this foot thing is a good reason to take a little break from running to recharge both physically and mentally. I will run the Falmouth Road Race for fun with friends but after that I am going to take some time off from training plans and racing. · I tried crabs! Totally random and unrelated to running but definitely a highlight of the week worth mentioning. · 3 weeks until the Falmouth Road Race!